Fascinating detail, Allan. Could you make out Rima Hadley visually? Thanks Stefan ; I did indeed spend some time trying to spot the Hadley Rille, but the turbulent air this evening did not offer enough resolution to allow me to see it. (for details, click on the link in my previous post). Edited by AllanDystrup, 16 January 2019 - 06:48 AM. We haven’t seen the Sun here since last Friday before It started snowing! 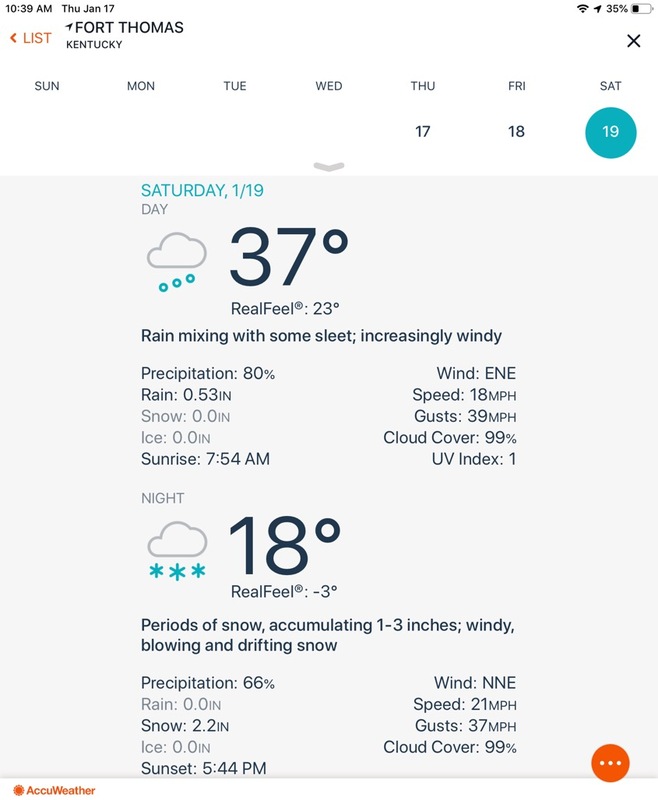 I’ve only seen the stars peak out through a sucker hole twice since, and now it is forecast to be cloudy day and night for the next ten days with more snow on the way! Got up at 5:45 and took out the RV6. Jupiter was good once the mirror cooled down. NEB is obvious, SEB very faint. GRS also visible. Venus and M57 were nice too. Here outside of Heidelberg it has been raining or snowing since Christmas. Last night there was a glow in the sky that let me know that we still have a moon up there, and today there is actually a little blue sky visible between showers! This is the type of weather that makes me stop thinking about what to observe and instead think of what I can (but really shouldn't) buy. Record drought last summer. The mighty river Rhine drying up. Currently snow storms in parts of the Alps like never seen before. Rain, rain, rain in my neck of the woods. Few clear nights and a bubbling atmosphere. Not worth putting a scope outside, not even binoculars. Climate change??? Took this photo last night with my C90 and Canon T3i, forgot to enable the shutter delay so it's a little blurred from shaking. 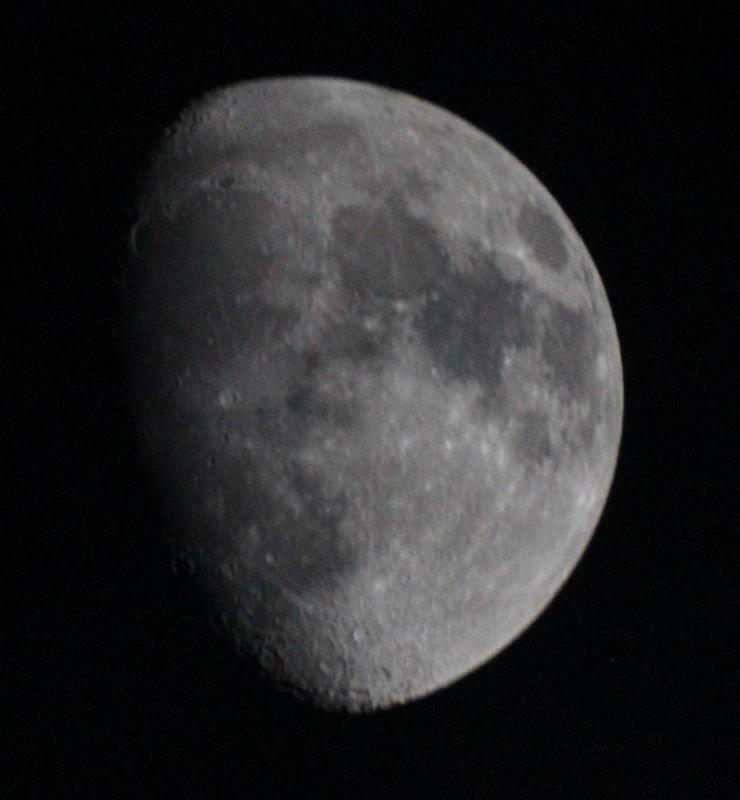 For a first astrophoto with this camera, though, it's not bad. Here it's supposed to be below zero, probably lots of snow or ice on the ground, and 30mph winds, but hey, it's clear I guess. Oh, right you are. For some reason I was thinking it was the late night of the 19th early morning of the 20th because I read somewhere that people would be off so they could do an all-nighter. 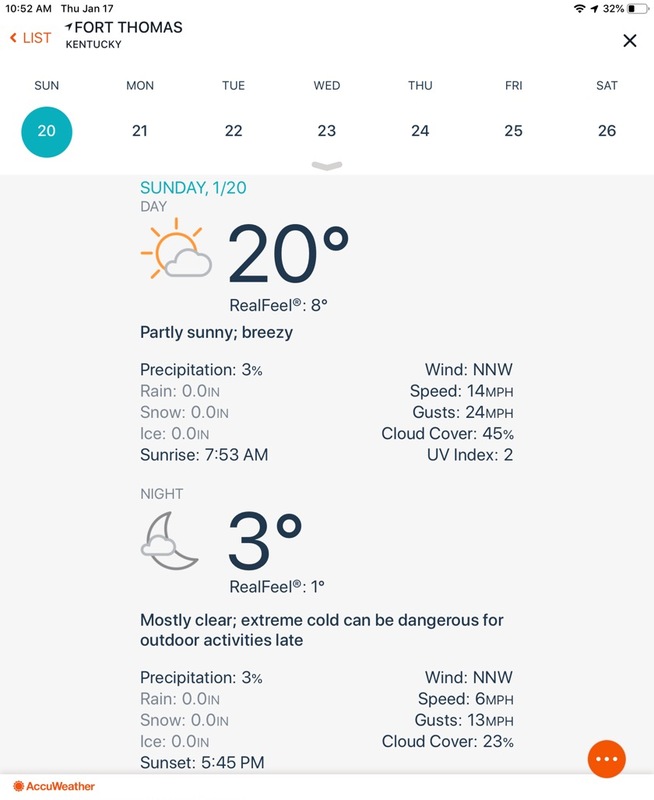 Oh well, Sunday night is forecast to be clear but brutallly cold. I do however have a couple of very well placed windows so will take peeks from indoors. 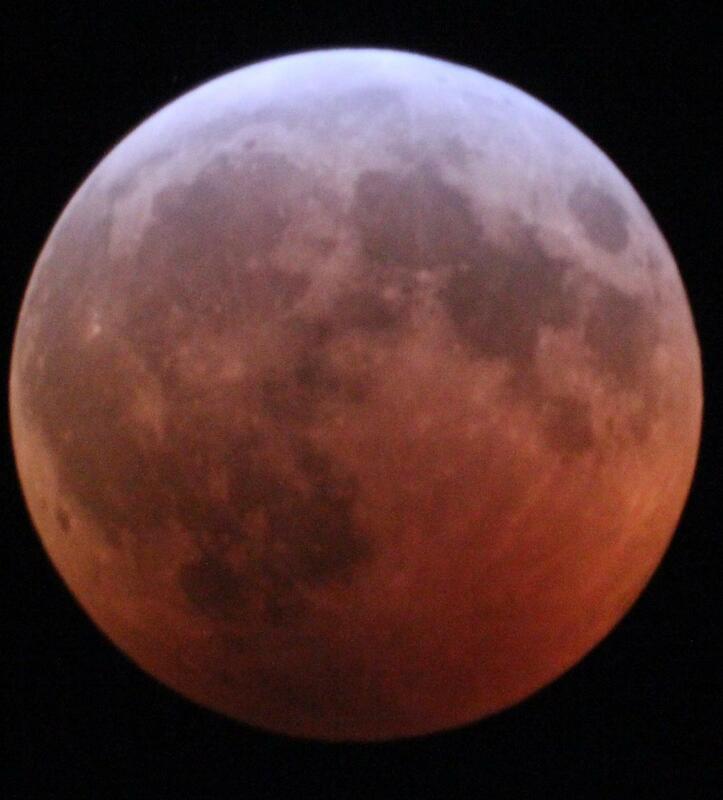 Naked eye or binoculars are fine with me for a lunar eclipse. (Jesus to Peter, Matthew 26:34). Edited by AllanDystrup, 19 January 2019 - 04:15 AM. 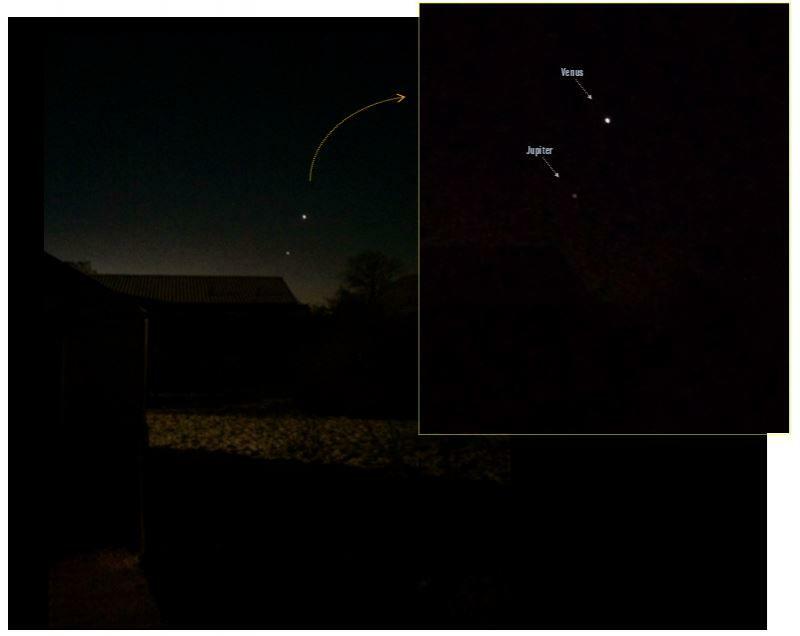 I will join showing a picture of Venus and Jupiter I made Thursday , at 7:15 a.m. .
To the West of Jupiter it was also visible Antares. Some dimmer stars where still visible in the dawn but not for long. I watched only with the naked eyes ,however it was a precious sight in this days of my recent life poor very poor in starlight. 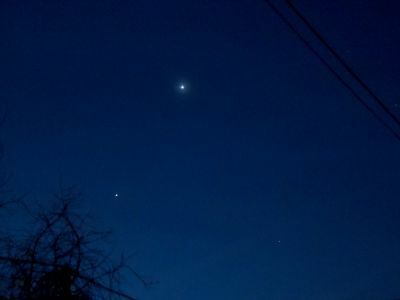 I also saw Jupiter and Venus early this morning. I woke up at 5:45am and since lately my good sleep has gone, I did not feel like turning around and trying to sleep some more. I grabbed instead my night vision device with old camera lenses + H-alpha filters and panned for a bit towards the only open sky visible from inside my house, unfortunately the most light polluted one, towards the East. The stars came out in sight but I did not pick any interesting DSOs besides some very open cluster. When with SkySafari I confirmed that there was not much else to see, I also found that the two extremely bright light points mostly hidden behind branches towards the South were Jupiter and Venus. So after about 45' of relaxing astro-fumbling, I felt sleepy again and back to bed I went. At 0600 I noticed the skies appeared to be clear as a bell. The moon was too low to the west, due to the woods that run along the "creek" on that edge of our property, but I could see Venus and Jupiter rising to our south/east. 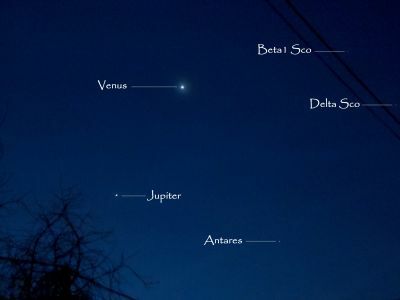 I knew Jupiter was showing itself again, but my timing has not been good. I was excited to get a look this morning, but at 2*F, I was NOT excited to get outside. I thought I would compromise and take advantage of our unheated front porch. I set the C102F up in the doorway, and had a good vantage point, since both planets are so low. Big bust. Even after letting the scope sit in the open doorway for 20 minutes, I think a combination of being lazy/wimpy thus keeping the scope half in/half out, plus the low altitude, and the apparent bad seeing, resulted in being barely able to bring the image to a focus that would allow two moons to be visible. Once I thought I caught a glimpse of the bands. Mostly what I saw was a boiling mass of white and off-white. It was still great to see that Jupiter is back. Hoping the weather stays clear for the eclipse tonight. Atmospheric is predicting clear skies and average to above average seeing at around midnight here. If I can read and comprehend what I have found, that puts me right at the peak of the eclipse. I guess we will find out. Clear skies to all of you! As the evening approached, my wife and I were anxiously looking forward to the eclipse. It was looking quite bad, but then, the high clouds began to clear, so I brought out the always ready Mayflower 814 and popped in a 42mm Celestron Ultima. Next, my neighbor and his (young adult), granddaughter came by to take a look. The sky became quite clear just before totality, then bam, on came the clouds. As the winds picked up, we all took turns waiting for some holes. I was really surprised to hear that in his (I'd estimate), 70+ years, my neighbor had never seen an eclipse or had viewed the Moon through a telescope and exclaimed it was absolutely beautiful. Around mid eclipse he asked his granddaughter should we go? She didn't say anything as he started to leave and surprised us when she hung back. She was mostly quite but really seemed to be enjoying it, so as the sky cleared I also turned the scope to the Orion Nebula and the Pleiades. Then to top it off, we saw a very bright fireball! My wife and I were really surprised that she end up watching the entire eclipse and thank us as she left. Then, wouldn't you know it, the sky was completely cloud free as the eclipse ended. I have to admit it's been awhile since I was able to get out and observe. I also have to say, I was a bit surprised how the little Mayflower really impressed me. The Moon during the partial phases did at times seem to take on the 3d marble effect. All in all, it was a great evening! It was too cold/windy to take out the RV6, but I set up the C90 and used it with my Canon T3i to snap some pictures of the eclipse last night. Here's my best (and funny enough, last) shot (cropped/compressed to fit on the site). Our weather has been dismal lately, but when I rolled in this evening after work... skies looked promising... fairly clear. I decided to use the opportunity to get some first light on my recently purchased classic. The good old Celestron Pacific C5, but this one is the telephoto version @ F/6. Being super light, I set it up on the Polaris mount and roughly aimed at M42, and wow ! - superb views in such a handy little scope, I was amazed. I hit a few other targets nearby, and packed it in early. The SCT rotary eyepiece holder came Thursday. It's a NOS 4-slot .965" unit that Brian has on sale here. Fit my 1976 C5 perfectly, except... it needs maybe 2mm to clear the focus knob -- nudges it out of focus as you spin it around. I loaded it with spectros 25/20/15/10mm eyepieces, and tested it against another 5" scope -- my triplet F5 refractor. 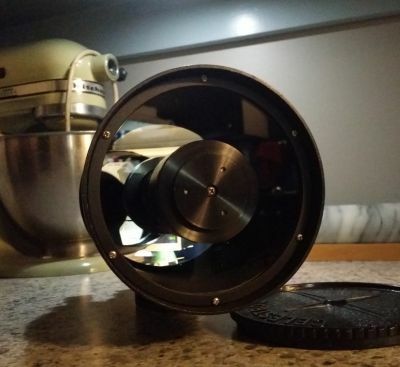 The rotary holder is very nice - positive "click" when the eyepiece is set. I started with Mars in the C5. I made out a marking at 125x with the PL10, and the phase. Vibrant colors in the old SCT. Collimation held from the previous sessions. These turrets make zooming up/down easy -- and since we'd been back from The Gulf only a couple of hours, I was in a mood for easy. On to clusters & such, and the refractor dazzled as usual. Had both scopes at 50x, and the triplet resolved more of M37's faint stars than the C5. But zooming up to 80x, it completely filled the field -- beautiful! Took less time to star-hop to M37, M38, & M36 with the frac. But I think a newbie wouldn't have too much trouble. A good thing, as the C5's tiny straight-through finder gets into unusable positions! If I had just the C5 and the Questar, the C5 would be my DSO scope. The extra aperture makes a difference, and it's no more trouble to tote out, set up, and move around the yard than the Q on its D&S tripod. Edited by Bomber Bob, 26 January 2019 - 08:51 PM. I’m glad you are enjoying your C5 JW. Iliked mine the few years that I had it. For me tho, in thinning the herd I just couldn’t justify keeping it. My Orange C8 (also a 1977 like my C5) showed so much more and was hardly anymore work to carry out and set up or take down (both were the large base fork mount and the C8 not in the trunk weighed no more than the C5 in the trunk and was smaller). I think my C8 which gives very sharp images and works great mechanically is the perfect complement for my Questar. If I could only have two scopes, those two and a nice pair of binoculars could keep me going for a long time. The morning Sun. Here’s the setup, Polarex 128 60mm with Meade QX 15 Wide Angle and 1000 Oaks solar filter. Photos were taken with iPhone held to eyepiece. Even witnessed a satellite transit! Wished I could have caught it in a photo! Edited by Compressorguy, 27 January 2019 - 10:38 AM. I've seen some great deals on orange C8 OTAs, so if the VMC200L gets too annoying (like losing collimation between sessions), it'll be gone. So far, the C5 stays locked-in, and it makes a great display -- so darn cute! The VMC200L is trickier to collimate than my SCTs, but I like the views, and how quickly it temp adapts with no dew. But yeah, if I got a C8, I could see the C5 going -- to a child in the family who's scope-less (can't have THAT). I solved the rotary's gap problem. I forgot that I have a Celestron thread-on LPR filter. No focuser nudging, and the optics are sealed against dust. The C5 isn't quite as sharp as the Questar or my fracs, but it's more of a jack-of-all-trades than the Q. Sure, on most nights my Dakin 4 would whoop it, but... it's The Dakin. Got 90 mins with the C5 and VMC200L tonight. At sunset, Mars just past meridian, and still tiny. But at 227x [OR9] the field maksutov revealed several markings. First thing that struck me was how muted the colors are vs. the C5 and my long achromatics -- pale salmons / grays / whites -- disk color like my 6" ED. Some folks criticize the Tak & Vixen focusers... I have no complaints -- all 3 of mine will get a sharp limb. C5 has that big LPR filter & rotary eyepiece holder on it. The filter helped break out M31 & M32, but all 3 galaxies fit in the field of the VMC using a vintage UO (N-S?) ER32 @ 62x -- and that's with the trio sinking west & less than 10* from our pollution dome. Huge M31 -- the 8" mirror gave a bright core & big oval. With the LPR the C5 showed more faint stars in M37 than last night; and, the VMC showed more stars overall than the 5" F5 last night, but again the colors were paler. Both CATs show tiny stars -- the VMC's are closer to a frac's pinpoints. M35 is a field full of stars! The view is staggering 3D in the 152ED, but it can't ride on the Tak EM-1S. All scopes are back indoors. NWS says we'll get SNOW on Tues -- with accumulation. May as well shut this state down, and keep folks off the roads! Anywho, my next session (assuming a Moon-free SAT night) will be the VMC vs. my 152ED. On Sunday night (1-27-19), took the 60mm Monolux 4380 & RV-6 out to track down some "new" Messiers and a few Herschels in Leo. Unfortunately unexpected high clouds impeded these plans. The Monolux was able to bag M97 (the Owl Nebula) and M108 in UMa. Both were faint and required AV with a 16mm UO Konig. The owl stood out more than the faint elongation of M108. Re-visited M81/82 in UMa - nice and bright with a 26mm Celestron Plossl. While in the vicinity, was able to observe NGC3077 & 3147, two Herschel galaxies. Both stood out well with the 16mm. Also revisited M74 in Pisces and M67 in Cancer; IMHO one of the best 60mm clusters. In addition to the Herschels near M81/82, the RV-6 (5.5) also snagged NGC 2974 in Sextans. Small, elongated and faint with a bright field star involved. The field star greatly obscures the galaxy from popping out; best viewed with a Celestron 12.5mm Ultima. Then the dew dropped and we packed up. I continue to be impressed how many still use the RV6 for DSO's. It's amazing what it can do for such a low, low cost.